Periodontal tools are used to prevent and reverse periodontal disease, and to maintain dental health. A number of tools are used in periodontal health, including probes, hoes, knives, files, scalers, and curettes. There are two common types of probes used in periodontal work: Williams periodontal probes and Furcation probes. Both kinds are used to measure pocket depth in millimeters, though Furcation probes are specialized tools designed to measure the horizontal or vertical pocket depth of multirooted teeth. Computerized probes are available. Hoes remove calculus and plaque using a push-pull motion. There are different types available, depending upon where they will be used: mesial/distal, buccal/lingual, anterior, and posterior. A back-action hoe removes bone next to teeth without trauma. The kidney-shaped periodontal knife is used in gingivectormy and gingivoplasty procedures, while the spear-pointed interdental knife is used to cut the gingival and remove tissue. Both come in several different sizes. Interdental files are tools used to remove heavy deposits of plaque and calculus from the interproximal area. These files come in a range of styles and angles, including curved, straight, mesial/distal, and buccal/lingual. 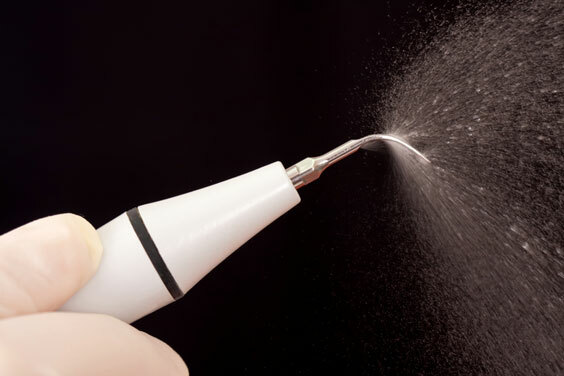 Scalers are used to remove calculus and plaque. Scaler types include Jacquette scalers, push scalers, and sickle scalers. Universal curettes remove stains, calculus, and plaque, and can also be used in root planing. They can be single or double ended. The ends of double-ended instruments are typically mirror images of each other, and are perpendicular to the shank.